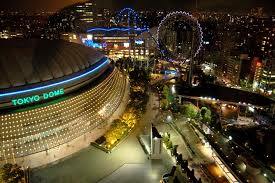 Tokyo Dome City will play host to this year's Miss International pageant. The 58th edition of Miss International will be held on 9th of November, Friday at the Tokyo Dome City Hall. Tokyo Dome City (東京ドームシティ Tōkyō Dōmu Shiti), referred to as Big Egg City before January 1, 2000, is an entertainment complex in Bunkyo, Tokyo, Japan. Kevin Lilliana of Indonesia will crown her successor at the end of the coronation night.